Back cover blurb: Late one night a man walks into the luxurious home of disgraced banker Harry McNamara and his wife Julie. The man launches an unspeakably brutal attack on Harry as a horror-struck Julie watches, frozen by fear. Just an hour later the attacker, JP Carney, has handed himself in to the police. He confesses to beating Harry to death, but JP claims that the assault was not premeditated and that he didn’t know the identity of his victim. With a man as notorious as Harry McNamara, the detectives cannot help wondering, was this really a random act of violence or is it linked to one of Harry’s many sins: corruption, greed, betrayal? This gripping psychological thriller will have you questioning, who - of Harry, Julie and JP - is really the guilty one? And is Carney’s surrender driven by a guilty conscience or is his confession a calculated move in a deadly game? 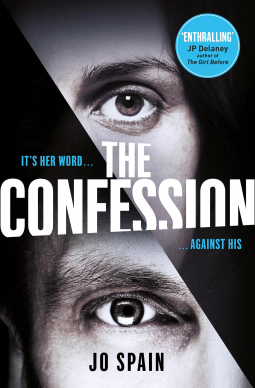 The Confession is a very clever novel and is set to be a big hitter in 2018. JP Carney walks into Harry McNamara's house and brutally attacks him one night. He hands himself in to the Police immediately and swears it was just a random act of violence, that he wasn't attempting murder, and that he has no idea who Harry McNamara is. The Police find this difficult to believe, Harry McNamara is a disgraced former banker worth millions. Famous for being filthy rich at a young age, Harry's fame only increased when his bank was bought into question then investigated as part of a major financial Fraud scandal. Harry bailed out of the bank leaving others in charge, and has recently been cleared of any wrong doing, but he's spent months in the public eye as the case has been dragged through the the courts, so it seems impossible that JP has no idea who Harry is. JP himself couldn't be any more different to Harry, and at first the Police believe that Harry's significant wealth is the reason behind the attack. JP knows exactly who Harry is, but his motive isn't monetary. Thank You to the publishers who granted my wish via netgalley in exchange for an honest review.